‘In Modern History’ is the highly anticipated 4th album by award-winning folk musician Jim Moray and is available for free, exclusively with the June issue of Songlines magazine (#68). The album includes guest appearances from the Orchestra of Opera North and Eliza Carthy. 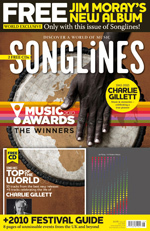 The issue also includes details of the winners of the Songlines Music Awards 2010 and comes with the regular Songlines 15-track compilation CD featuring the best new album releases and a playlist celebrating the life of Charlie Gillett.